The Penguins came into the game needing 2 points to keep pace with both New York teams in front of them in the standings and on hot streaks. The Flames had been in a free fall, going 1-8-1 in their previous 10 games, and allowed the most goals per game of any team in the league. It was a great chance for the Pens to add 2 points to their total in the standings, but they squandered a golden opportunity to keep pace in the Metro Division by falling to the Calgary Flames 4-2. In contrast to recent afternoon games, the Penguins started off strong before faltering down the stretch. It's a blown opportunity against the worst team in the Western Conference, and with a schedule that pits the Penguins against the Metropolitan Division in 14 of their final 18 games it's only going to get more difficult from here on out. The Penguins struck quick, scoring just 30 seconds into the game off a Crosby shot off the back boards. The puck bounced back into goalie Joni Ortio's feet, and his left skate sent it back towards the goal. Sean Monahan had a chance to keep it out, but he couldn't get a solid piece of it, and Patric Hornqvist was able to clean up the loose puck to give the Pens the early 1-0 lead. But moments later Calgary was able to get on the board and tie the game back up. A Sam Bennett backhand shot was headed wide of the goal, but Joe Colborne managed to stick his foot out just enough to redirect the puck into the net off his skate. The Penguins continued pressing taking the lead and did a good job of forcing play into the Calgary zone. Mikael Backlund had a great opportunity on a break away, but Marc-Andre Fleury poke checked the puck away. Minutes later the Pens almost pulled ahead when Evgeni Malkin made a great pass to find Phil Kessel on the far post with an open net, but Kessel couldn't handle the pass to put it home. Scott Wilson had a wide open net off a rebound, but Jakub Nakladal just managed to get the shaft of his stick on the shot the deflect it wide of the goal. It felt like it was only a matter of time until the Penguins took the lead in what was an unusually strong performance for the Penguins to kick off an afternoon game. They didn't get result they deserved with their dominating performance in the 1st period and took the 1-1 tie into the first intermission, but the Pens controlled 60% of the shot attempts in the period and had 13 of the 18 scoring chances (72.2%). The Penguins were finally able to break through for their second of the game 5 minutes into the 2nd period. This time, it was Sidney Crosby tipping in a Patric Horqvist shot from the right post to give the Pens the 2-1 lead. But again the Flames quickly answered. A minute and a half later Mark Giordano took a pass heading down the left side on the secondary rush and wristed a shot past Fleury to make it 2-2. 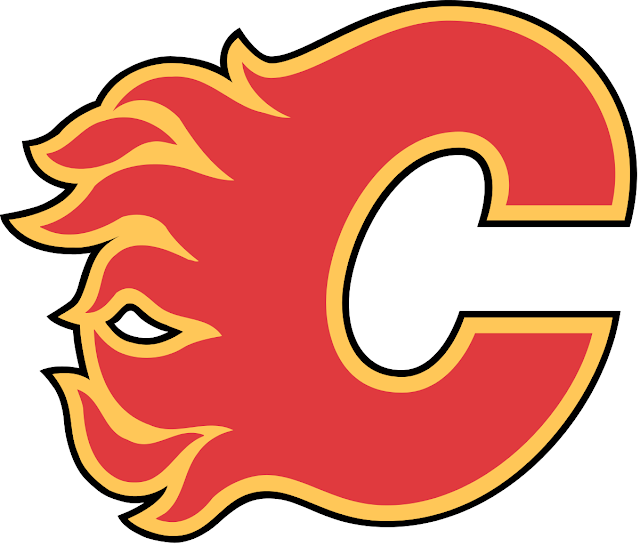 The Flames had been turning the momentum throughout the 2nd period, but it was a 4 minute highsticking penalty by Tom Kuhnhackl on Nakladal that gave Calgary the break they needed. While the Penguins managed to kill off the opportunity, it was Backlund scoring seconds after the expiration of Kuhnhackl's penalty to give the Flames the 3-2 lead. It was a big goal right as the Penguins had seemed to get themselves out of the woods on the double minor, and it was a lead that the Flames would take with them into the locker room. The Penguins got their first power play of the game early in the 3rd period when Jyrki Jokipakka boarded Bryan Rust in the corner. The Penguins needed their struggling power play to find its stride and tie up the game, but the Pens weren't able to take advantage and didn't pose much of a threat with the man advantage. The Flames nearly scored a short handed goal on a 2-on-1, but Fleury managed to get just enough of a TJ Brodie one timer to keep the Calgary lead at 1. Calgary had another great opportunity to extend their lead further when Phil Kessel batted a puck over the glass in the defensive zone midway through the 3rd for a delay of game penalty, but the Penguins were able to hold strong and prevent the Flames from taking advantage of their power play. Ultimately though the Flames were able to break through with just under 6 minutes left in the game. Fleury wasn't able to control the rebound on the initial shot by Lance Bouma, and Bouma was able to gather the rebound and beat him from the right circle. The Pens pulled Fleury with over 3 minutes left in the game down by 2, but they were unable to score with the 6th man on the ice, even after Dougie Hamilton took a slashing penalty on Chris Kunitz with just over 2 and a half minutes left to give the Penguins a 6-on-4. The Penguins started off fast, controlling the possession in the 1st period before the Flames were able to turn the tide in the 2nd. 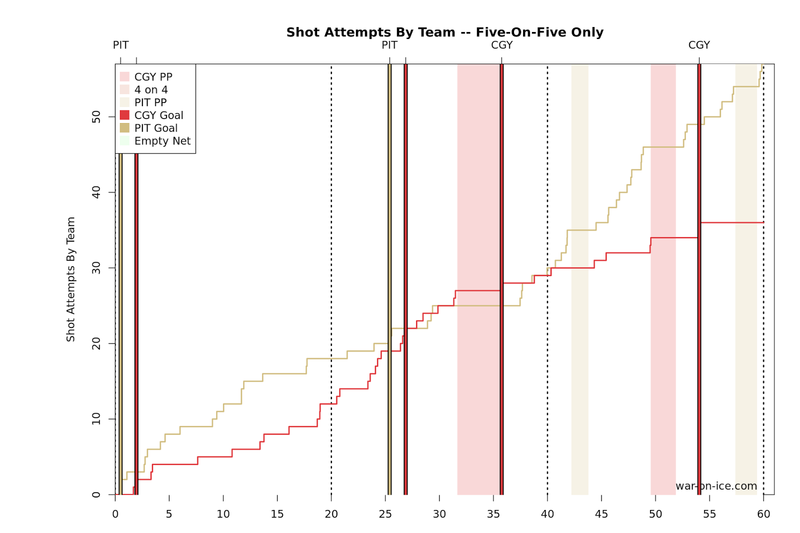 The Pens were able to drive possession in the 3rd, and they finished with a score-adjusted 55.7 CF% for the game, but already down a goal they needed one to tie it up and couldn't get it. Pittsburgh will travel to New Jersey tomorrow for their 5th game in the last 7 days, and they'll need to get 2 points against a Devils team that will be without their star netminder Cory Schneider.